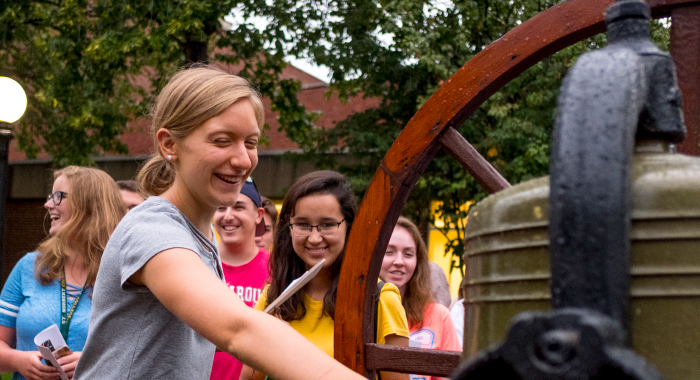 Continuing a long tradition, this year’s first-years touch the Victory Bell for good luck during Convocation, which kicks off the 2018-19 school year. St. Norbert College is welcoming its largest, most diverse class this fall. 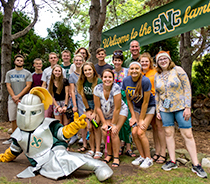 The college received a record-number of applications for this year’s class, and 624 new first-year students have become part of the SNC community, as well as 24 transfer students. As the biggest, most diverse class, the Class of 2022 has already set itself apart. And the first-years themselves have as well, with not-insignificant accomplishments under their belts even before they began their college careers. This year’s incoming class of students is the first to be born in the 21st century, and their experiences thus far set them apart. • They have always been able to refer to Wikipedia. • The phrase “You’ve got mail” is likely lost on them. • A visit to the bank has always been a rare event. • Mass-market books have always been available as Ebooks. • “Oprah” has always been a magazine. Thanks to our Wisconsin Association of Independent Colleges & Universities partner Beloit College and its annually published Mindset list, for these insights into the world of those entering college this year.